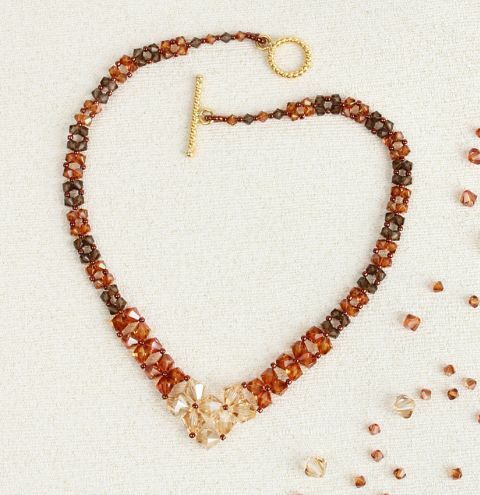 Make a dazzling Copper Glow Necklace using delicate Swarovski crystal bicones and matching seed beads. Finish your design with a bright gold plated clasp! Stunning crystal bicones don’t need a complicated design to show them off to their very best. The technique is a variation of right angle weave where seed beads form the crossover point. With an extension chain added, the finished necklace will be 44cm long. To extend the length add additional beads in step 2. By graduating the size of the bicones, the finished result is a stunning shape and gives you a focal, statement finish with simplicity. Cut 200cm of beading thread. Thread a needle onto both ends. String 7 seed beads and push to the middle of the strand. Thread your needle through the jumpring of your clasp, so that it will sit over these beads, we are going to capture it into a loop. Bring both strands together and string a seed bead then a 4mm crystal bicone four times. For the remainder of the project the words seed bead will be abbreviated to ‘sb’ and only the size of the required bicones mentioned. Add a final seed bead before separating the strands. *Extend this length if you need a longer necklace. Onto each strand add: 4mm, sb, 4mm. Cross both strands through a new sb. Repeat twelve times. As you add each group of beads pull firmly and equally on both strands. If one group becomes slightly misaligned, press down on the last group added with your finger then smoothly stroke, several times, along the beads to the clasp end. Onto each strand add: 4mm, sb, 6mm. Cross both strands through a new sb. Onto each strand add: 6mm, sb, 6mm. Cross both strands through a new sb. Onto each strand add: 6mm, sb, 8mm. Cross both strands through a new sb. Onto the left strand add: 8mm, sb, 8mm, sb, 8mm. Onto the right strand add: 8mm. Cross both strands through a new sb. Onto each strand add: 8mm, sb, 6mm. Cross both strands through a new sb. Rotate your work so that threading is easier. Onto each strand add: 6mm, sb, 4mm. Cross both strands through a new sb. Onto each strand add: 4mm, sb, 4mm. Cross both strands through a new sb. Keeping both strands together and string a 4mm then a sb four times. Add another single sb then separate the strands. Onto one strand add 7 sb. Pass it through the single sb added at the beginning of this step. Pull almost tight to form a loop. Pass the other strand, in the opposite direction around the loop then pass through the last single sb added in step 14. Check that there aren’t any gaps between the last group of beads then knot both strands together. Pass them both through the 4mm and pull most of the way through. Add a dab of glue to the knot then pull both strands evenly so the knot is pulled into the 4mm. Go through the next sb and repeat the knotting method. Allow the glue to dry completely then trim the excess. Open a jump ring and feed it through the seed bead loop at the end of the necklace. Attach your clasp to a jumpring on each of the end loops. You can add an extension chain on before your clasp if you want to make the necklace longer.